Increase Productivity at your Business with Collaborative Robots! Home Latest News Increase Productivity at your Business with Collaborative Robots! Universal Robots are leading the collaborative robot industry with their 3 light weight, collaborative robots. The UR arms can be virtually implemented into any industry, completing any process, by any employee. Unpacking the robot, mounting it and programming the first simple tasks typically takes less than an hour, even for untrained operators. As experience by Universal Robots customers, the average time it takes to carry out a complete set-up is just half a day. 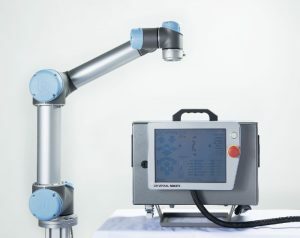 Operators with no programming experience can quickly program a Universal Robot, thanks to its clear, in-built 3D visualization. All the operator must do is move the robotic arm to the desired waypoints or touch the arrow keys on the easy-to-use tablet. In order to meet challenging demands and stay competitive within the market, production set-ups must be versatile and flexible, and universal robots have the robots that are just that. 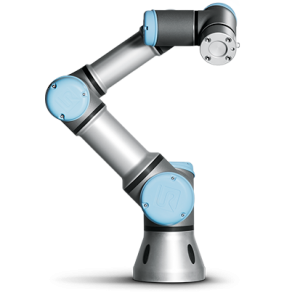 The lightweight robotic arms are easily moved and re-deployed to a new process, allowing the automation of almost any manual task within your production line. Universal Robots are the frontrunners of collaborative robots with more than 80% of their robotic arms in operation are working right alongside humans, without any safety guards. Universal Robots collaborative robot arms have an average payback time of only 195 days, which is the fastest in the industry. Simply because there is no additional payments that are traditionally associated with automation, such as protective fencing and external programming. View Our Video on the Collaborative Universal Robots here! Want to learn more about our collaborative robots and how they can help your business? Call (03) 9761 8500 or email enquiries@mobileautomation.com.au now and our friendly sales team will make an appointment to show you first-hand how we can improve your business.